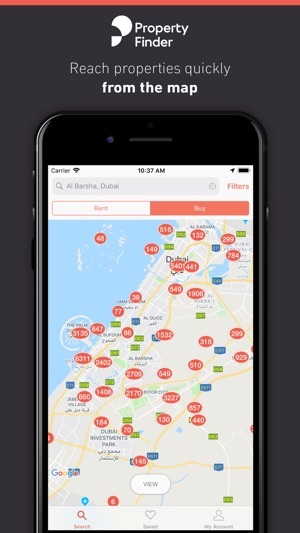 Browse thousands of homes for rent or sale in UAE, Bahrain, Qatar, Egypt, and Lebanon on the #1 property portal in the Middle East. 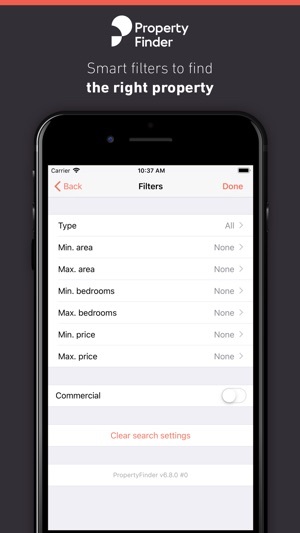 Go ahead, get super-specific: Customise your search using filters like property type, number of bedrooms, price, size, and amenities. 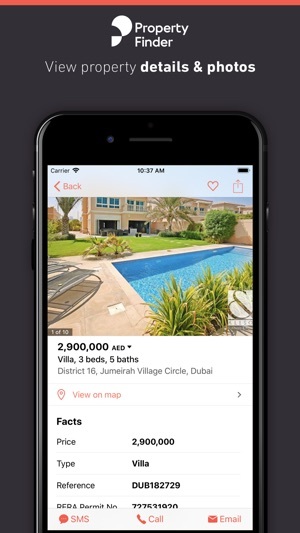 Search by community, sub-community, tower, and building in your preferred location, and select from a wide range of property types from apartments to villas, offices. and plots of land. Not sure which building? Use our nifty Map view to navigate around a neighborhood, and see the number of listings per building, or check out properties around you. Browse in your native language with full English and Arabic support, and lock down your budget with different currency views and price breakdowns by week, month, and year. See a property you like? Contact the listing agent via Phone, SMS or Email. 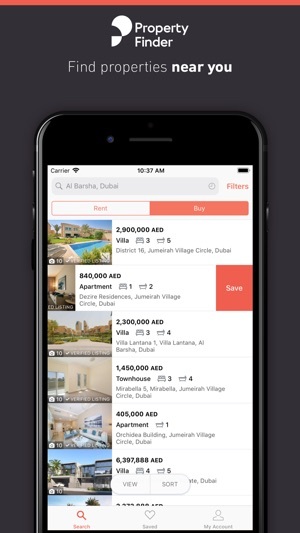 Or if you aren’t quite ready to commit, save your favourite properties across all your devices or share listings you like with anyone via SMS, email, and social media. And while you’re still here: soak in the Apple Watch integration, iOS-friendly navigation, and gorgeous support for iPad and Retina display. Pretty slick, right? As always, we’d love to hear from you. 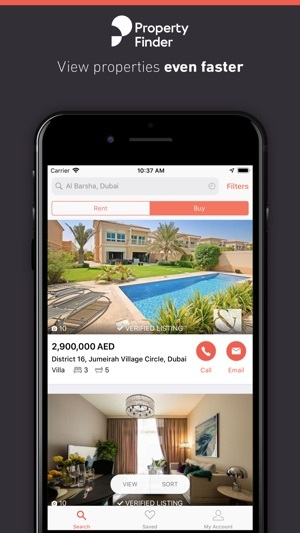 Tweet us @property_finder or drop us a line over at hello@propertyfinder.com and tell us what you think about our app. اطلّع على آلاف العقارات المعروضة للبيع أو الإيجار في الإمارات والبحرين وقطر ومصر ولبنان على الموقع العقاري الأول في الشرق الأوسط. لا تنتظر المزيد! خصص نتائج بحثك واختر نوع العقار، عدد غرفه، سعره، مساحته ومرافقه الخدميّة، هل تفضّل منطقة على حساب أُّخرى؟ ابحث عن العقارات بمنطقتك المفضّلة، حيّك المفضل أو حتى المبنى السكني الذي ترغب وخصص بحثك ليشمل المساحة التي تفضلها للشقق في ذلك المبنى. هل تواجه صعوبة بالبحث عن المنطقة التي تلبّي رغباتك؟ يمكنك بكل بساطة استخدام الخريطة لتطلع على المرافق الخدمية المتواجدة في تلك المنطقة وعدد الشقق، المباني أو حتى العقارات المتوافرة قريباً منك. يمكنك الاطلاع على العقارات بلغتك الأم وبدعم كامل باللغتين العربية والإنكليزيّة مع تحديد ميزانيتك بمختلف العملات وتفاصيل الأسعار بالأسبوع والشهر والسنة. هل أعجبتك إحدى العقارات؟ تواصل مع الوسيط العقاري عن طريق الهاتف أو الرسائل النصيّة أو البريد الإلكتروني، أما إن كنت غير متأكدٍ بعد! احفظ هذا العقار على جميع أجهزتك الإلكترونية لوقت لاحق أو قم بمشاركة هذه العقارات مع أصدقائك عن طريق الرسائل النصيّة، البريد الإلكتروني أو وسائل التواصل الاجتماعي. يسعدنا سماع آرائكم، أرسلوا تغريداتكم على @property_finder أو بريد إلكتروني على hello@propertyfinder.com سيسعدنا سماع آرائكم. We made some improvements to our Mortgage Finder widget to help home buyers secure the mortgage that’s right for them. Additionally, you might notice that some phone numbers you call will not have an extra extension added to the end. But worry not, this is simply a way for our agents to know exactly the property you’re calling about. This way, when following up with you about a missed call, agents will have all the relevant information about the property in which you’re interested before you having to tell them. We think it’ll be a huge time saver and will help get our customers to the next step of finding a dream home even faster. PF have outdone themselves in creating this all-in-one app. Allows for instant call backs in, efficiently organises leads and allows the broker to immediately share their listed properties with the client. Amazing work on being able to generate reports and show market comparisons. However, it is still in the works and is missing a number of additional helpful features such as sorting the properties (ie rent vs sale), or by price, support chat option and edit profile. It could show ad statistics such as number of clicks and/or impressions so brokers could know which of the ads generates most leads. Impressive work by PF, definitely a market leader! Thank you for the kind words and the helpful feedback! We love your suggestions, however it looks like this review was added to the wrong app. If you wouldn't mind, please submit this review to our Lead Tracker app in the app store. It is a great site which gives you a good feel of the market, the prices and availability. Main concern is related to multiple agents handling same units or already taken units which is quite frustrating, the system needs to be updated daily to avoid this point. Amazing update. It’s just I signed up with Facebook and it’s using my Facebook name and I can’t change it on my profile. Can you let me please change my profile details rather than just showing my profile. Glad to hear you liked the update! When you're using Facebook to log in, our app like all others can only use your FB profile name. Alternately you can create a PF account where you have more freedom to edit your name however you'd like.